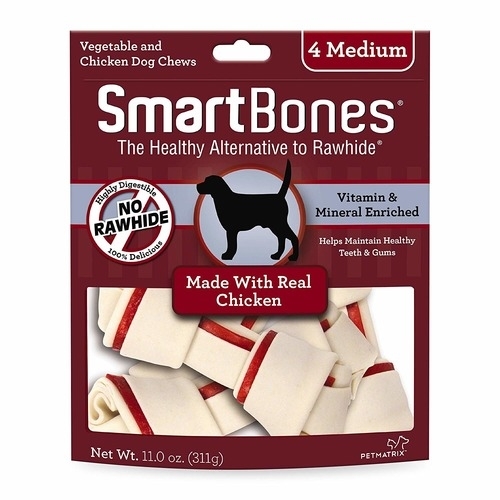 No rawhide SmartBone are made with real chicken and wholesome vegetables for a scrumptious taste dogs can’t resist! 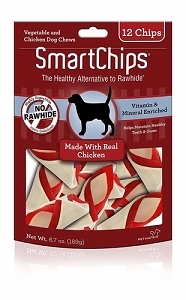 Vitamin and mineral enriched, these chews help maintain your pet’s healthy teeth and gums, and are 100% delicious! benefits of a rawhide chew – without the rawhide. Over 99% digestible. What does that mean? Digestibility Studies are quite complex and are carried out in accordance with a strict protocol established by AAFCO (Association of American Feed control Officials), by Kennel facilities registered with the USDA under the Animal Welfare Act. In its most basic form the study requires feeding specific dogs only dog food and measuring what goes in and what comes out and then repeating it with the same dogs but adding the treats to the dog food. 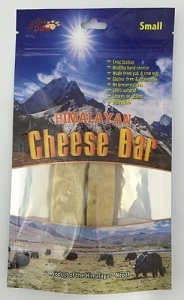 All output is lab-analyzed for protein, fat and caloric digestibility. Our standards required more than two years of formulation and re-formulation to finally achieve a 99.2% digestibility – a testament to the high standards and the quality of the ingredients we use. To put this in perspective even the best dog foods achieve only 85% total digestibility. 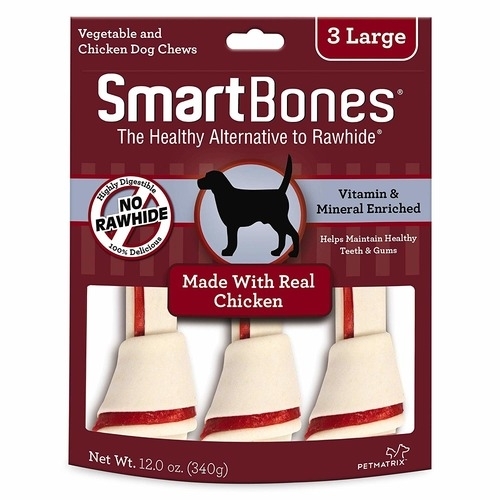 You can rest assured that your dog will get maximum nutritional value from SmartBones chews. Side Benefit: Smaller stools. Smart Bones for Smart Dogs. Preferred by 9 out 10 dogs over the leading rawhide chews. For palatability testing we used the leading rawhide dog chew on the market – again using a strict protocol – one of each treat is offered to a dog in a left and right bowl on one day then the bowl placement is reversed on the second day. Out of the 20 dogs, 18 dogs chose the SmartBones chew first on both days, and the other 2 dogs chose Smart Bones chew on one of the days so they were judged to show no preference; hence 9 out of 10. This is very convincing data, but in practice we guarantee that you will find that unlike dogs who simply try to pull hidden treats out of other rawhide products and leave the rawhide un-chewed, your dog will chew and eat all of the SmartBones chew. Why are SmartBones Fortified with Vitamins and Minerals? SmartBones chews are produced in a food grade production facility where we can formulate and control each and every ingredient. So we decided to fortify them with vitamins and minerals. By doing this you can be sure that along with their dry kibble dog food your dog's total diet will remain fully nutritionally balanced. Rawhide and many other chews don’t have the luxury to do this. 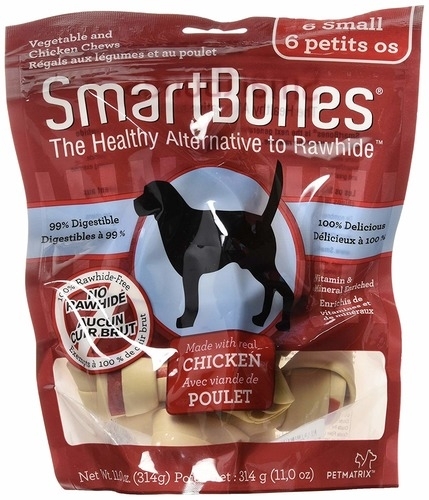 In fact, even though rawhide analyzes as over 80% protein, the protein is of such poor quality that it is actually “unavailable protein” and has almost zero nutritive value for a dogs body. That's why SmartBones chews are Smart. Why is it important for my dog to chew anyway? Historically, in the wild, dogs used to tear through the skin of a wild beast to get at the meat, cleaning their teeth naturally in the process. But today’s domesticated dogs eating kibble in a bowl never gets this exercise, and as a result, their canine teeth become disused and plaque can buildup. Ask any dental hygienist and they will tell you about how poor dental health even in pets can result in infections, kidney and heart diseases, let alone bad breath. Acids in the mouth can damage the gums resulting in gingivitis which in turn can lead to periodontitis – the leading cause of tooth loss. In addition, all dogs have an inherent desire to chew, especially puppies. Destructive chewing is often the result of a normal desire to chew and to relieve boredom. Over the years we have found that dog chews are an effective alternative to your furniture and shoes. These aren't like other chews I've seen. Are SmartBones chews patented ? Yes. In December, 2009, the US Patent and Trademark Office awarded us a Patent # 7,677,203 for one of the decade's most innovative and unique advancements in the Dog Chew category. 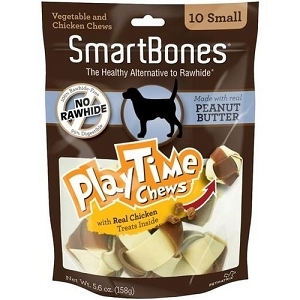 How many SmartBones chews should my dog have each day? Dog chew consumption is size-dependent but it is appropriate to feed 1-2 SmartBones chews of the correct size daily.